Hometown: Boonton, New Jersey, U.S.
Died: October 13, 2004 in Operation Iraqi Freedom. Army Major Charles Robert Soltes, Jr., 36, who grew up in Boonton Township, was killed in Iraq on Oct. 13 when a suicide driver plowed into his convoy vehicle. About 1,500 people attended the officer's funeral on Oct. 22 in San Juan Capistrano, Calif., at the church where Soltes and his wife, Sally, were married. "He touched a lot of people - many of whom neither I nor his wife knew - it's just like this ripple effect," said Soltes' sister, Carolyn Soltes-Matthies, who lives in California. "We knew how great he was - we didn't realize how many other people knew." 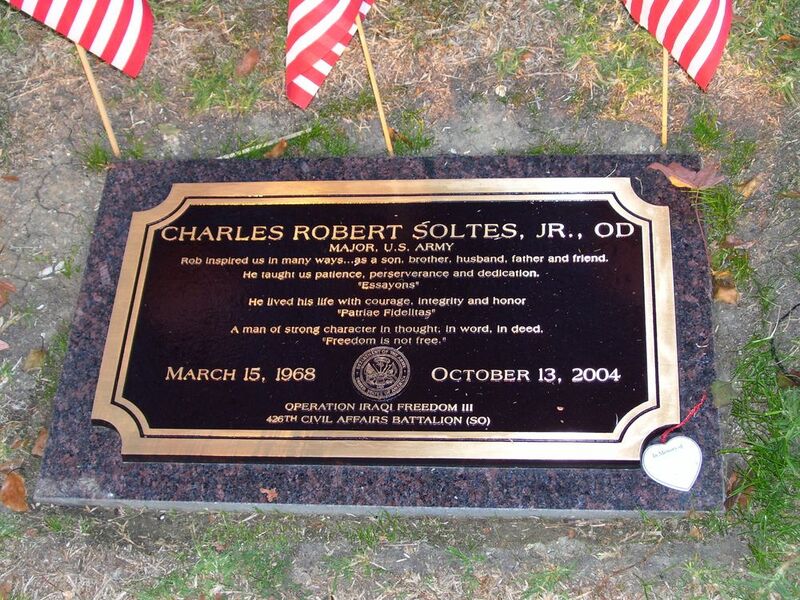 Soltes attended Rockaway Valley Elementary School and Morris Catholic High School in Denville, graduating in 1986. He attended Norwich Military College of Vermont and, upon graduation, entered New England College of Optometry where he met his wife-to-be. 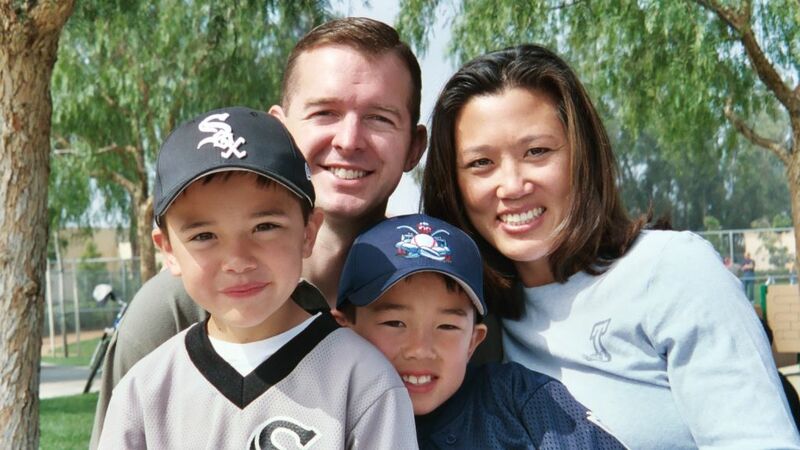 After having two children, both of whom were born in Army hospitals, the family moved to Irvine, Calif., in 1999. Both Soltes and his wife worked as optometrists. Soltes is survived by his parents, siblings Jeff and Carolyn, Soltes' wife, Sally, and their two sons, 10-year-old Ryan Alexander and 7-year-old Brandan Charles. His death has shaken friends and family, some of whom now live in California, home to Soltes and his wife and two children. For Boonton Township native Chris Lynch, 36, now of Lehigh, Pa, his best friend of 20-plus years was a "moral compass" - a brother he looked up to. When Lynch found out his childhood friend Soltes had died in combat in Iraq, not only did he lose a brother - an unspoken bond was broken, Lynch said. "That was the first thing that went through my mind - what am I going to do now?" Lynch said. "He always gave me a moral compass as to what direction to take." The last time Lynch heard from his best friend was in September through a letter in which Soltes expressed his excitement for his new mission abroad. He signed the letter - "your lifelong friend." "It's one of those friends who are irreplaceable," Lynch said. Lynch has fond memories of his childhood in Boonton with Soltes, who lived a couple miles away. "I grew up on a lake, and he would come over and fish," Lynch said. "I would live for the days when he would come over and spend a day or two at my house." Even 20 years later, Lynch said, he still remembers the words he exchanged with Soltes at his lakeside home. "They were special times between us," Lynch said. Selfless, optimistic, and generous is the way other friends and family described Soltes. Childhood friend Greg Licciardi was friends with brothers Jeff and Robert Soltes when they all lived in Boonton. "Whenever you saw him, you knew it was going to be a good day," Licciardi said. "He had an incredible spirit. He was always smiling. "However what Licciardi remembers most is Soltes' eagerness to help. Without a second thought, Soltes offered Licciardi his apartment at no charge in Boston while Licciardi searched for employment. "I just always remember that - certain people that are so generous," Licciardi said. Growing up in Boonton among hiking and nature trails may have made an impression on Soltes since he is known for loving outdoor and adventurous activities, according to his friends and family. "He loved it outside," Licciardi said. "He was a camp counselor and lifeguard, and had an incredible attitude." Soltes-Matthies and other family and friends are still reeling from the loss, she said. "It's still unbelievable to me," said Soltes-Matthies. "We just have this whole new circle of friends and family who knew Rob so they are all supporting all of us. That's what we're relying on." What stands out most about her younger brother is his confidence, said Soltes-Matthies, who is a year older than Robert. "He was always sure who he was and what he wanted out of life and about living life to the fullest and anything he did or anybody he had a relationship with - all supported who he was and what his goals were," Soltes-Matthies said. "That's one thing that I find extraordinary because not a lot of people even know who they are and go through life trying to figure it out. He knew it at a very young age." Soltes was deployed to Iraq in September. He was helping to rebuild hospitals in the country and was in charge of a health team that was coordinating health services and initiatives for the people in Iraq, said Soltes-Matthies. The officer was supposed to return home next summer. "Rob possessed a tremendous love for our country," wrote Robert Chen, who went to military school with Soltes and has known him since 1995. "He exemplified and demonstrated the utmost level of decorum and bearing expected of an officer in the United States Army." Soltes also gained a high reputation among the optometry and ophthalmology community. "The guy has a very high sense of duty even working in the practice," said ophthalmologist Dan Tran, who worked with Soltes. "You could tell he had some military training. When there's a need to do something, he put everything aside and put his responsibility in front of anything else." 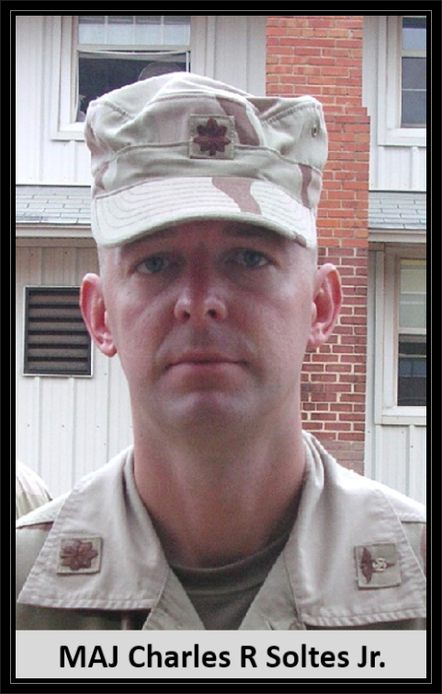 The explosion that struck Soltes' convoy which was returning from a local hospital, also killed Lt. Col. Mark P. Phelan, 44, of Green Lane, Pa. The 36-year-old Soltes was an officer with the Army Reserve's 426th Civil Affairs Battalion, stationed out of Upland, Calif., and based in Mosul, Iraq at the time.